Since “mirrorless” first became commonplace term to refer to any compact system camera, many accessory companies have been releasing products that carry the mirrorless label. 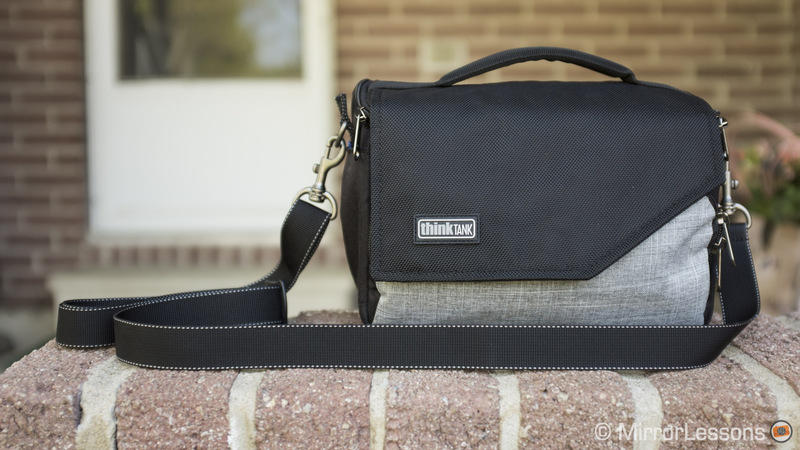 One product that has met great success is the Mirrorless Mover 20 by Think Tank, one of three Mirrorless Mover bags of varying sizes designed specifically for mirrorless systems. To see how the bag would hold up in a real world environment, I brought it along on our three-week trip to Canada where I used it on all our excursions. 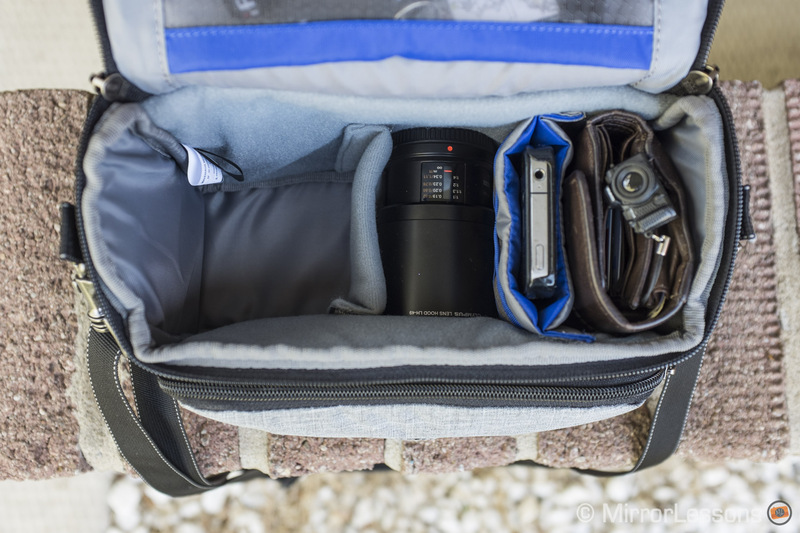 The prime characteristic I always look for from a bag that claims the mirrorless title is near-perfect compatibility with mirrorless systems. 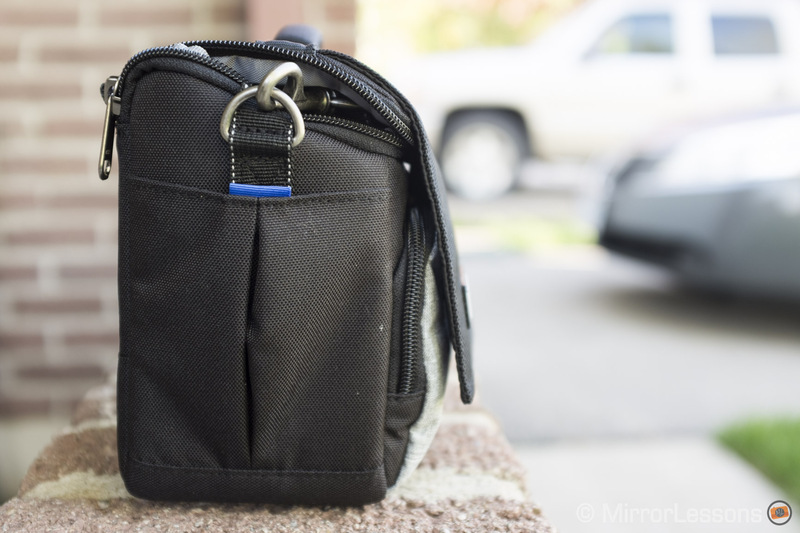 It should comfortably accommodate a mirrorless system without swallowing it whole as a DSLR bag might. I obviously couldn’t try it out with every mirrorless system on the market, so I went with the OM-D E-M1, whose size and weight represent the average professional compact system camera. In addition, I had two lenses, the brand new M.Zuiko 8mm f/1.8 and the fairly small M.Zuiko 60mm macro. Just as I had hoped, the largest compartment inside the bag proved a snug fit for these three pieces of equipment, with the 8mm attached to the camera and the 60mm kept in place by the velcro foam divider provided with the bag. Next to the largest compartment is a slim padded phone slot which fits all iPhone-sized smartphones. This is flanked by a smaller compartment which is the ideal size for a wallet or a small prime. I don’t know about you but I like the fact that there is a specific compartment for phones, as I am forever misplacing mine when I use other bags. 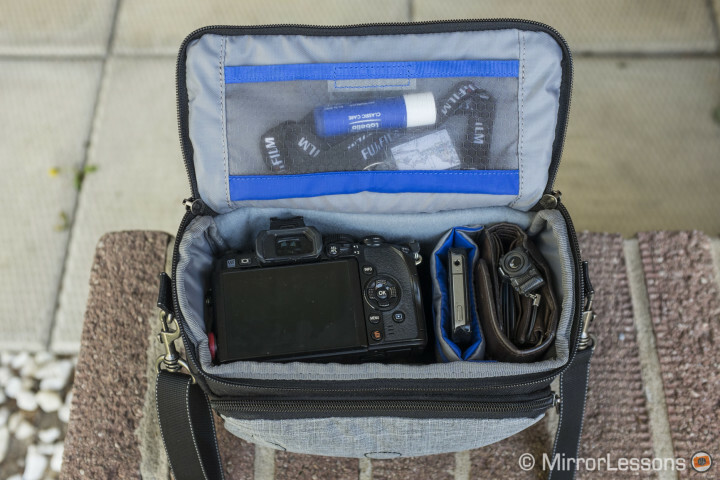 And while we’re on the topic of compartments, it is worth pointing out that the Mirrorless Mover 20 has plenty for smaller objects like memory cards, batteries or personal objects like keys or business cards. There are two stretchy gusseted pockets on either side, an internal mesh pocket on the underside of the lid and a larger zippered pocket on the front. 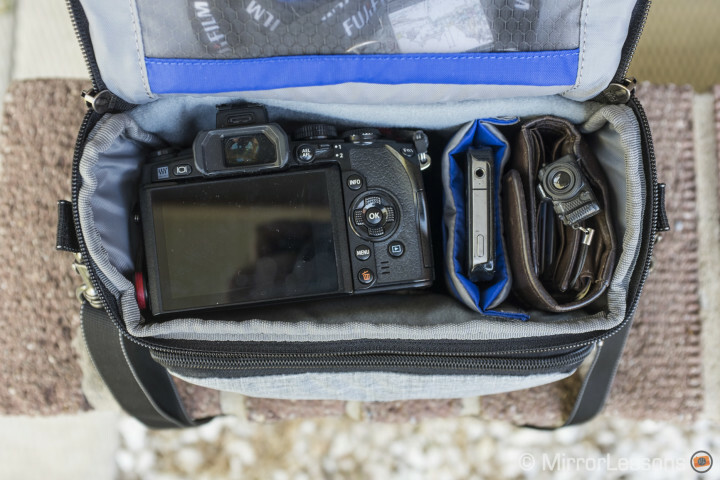 Considering its size, it is quite surprising just how many accessories you fit inside the bag beyond just your favourite camera gear. 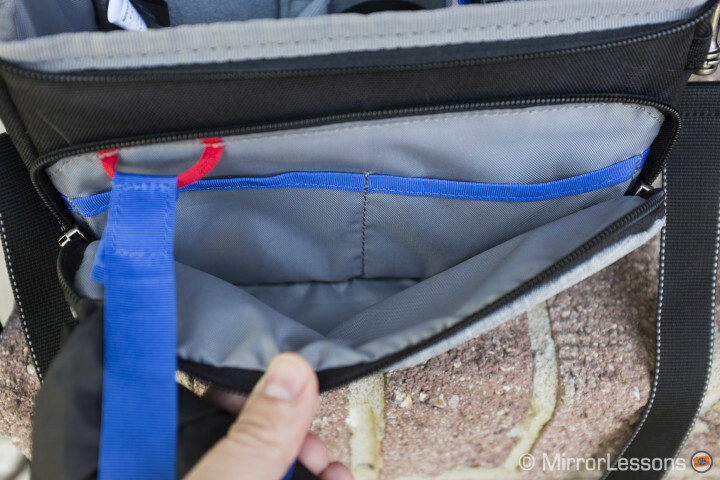 Another great feature is the rear pass-through slot which allows you to wear the bag on your own trouser belt. 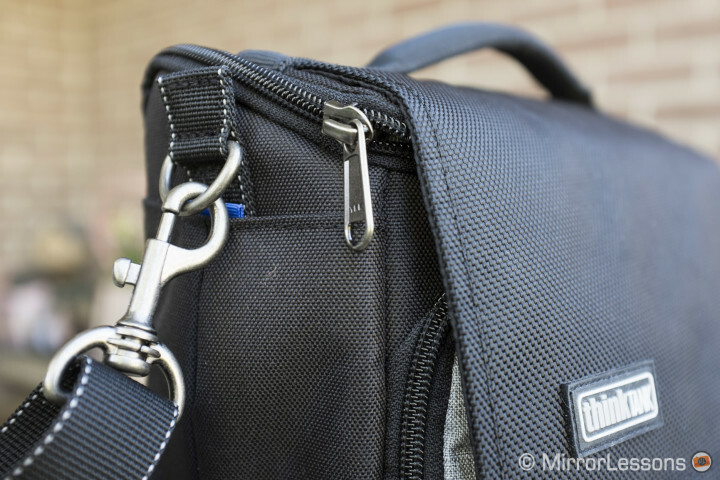 It is very useful for situations where you don’t want your bag to swing every which way as you walk, such as professional assignments where you may already have a couple of cameras hanging around your neck. 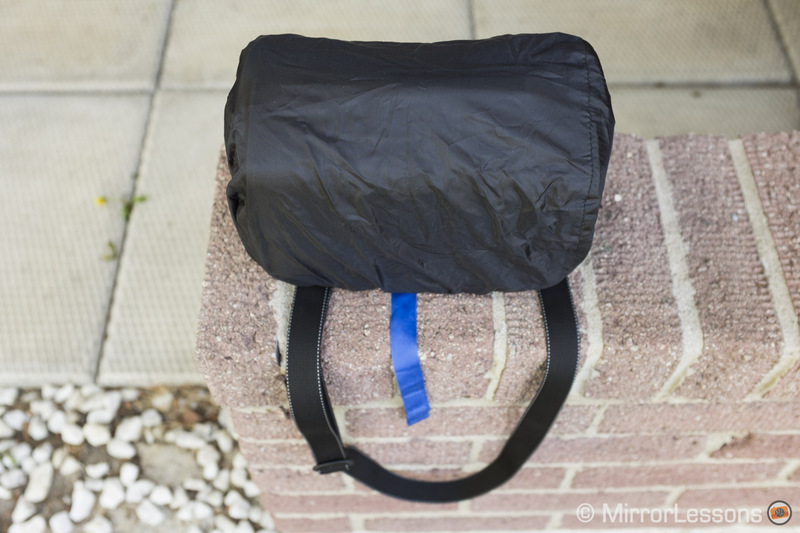 One drawback is that the belt loops on your trousers limit where you can place the bag: you have either the option of placing it directly at your side or around the back as Mat has done in the picture below. Unfortunately, neither position is ideal, but it is a useful option to have if you want to free your hands. I personally didn’t use it as a belt bag all that much as I did a lot of city walking in Canada. 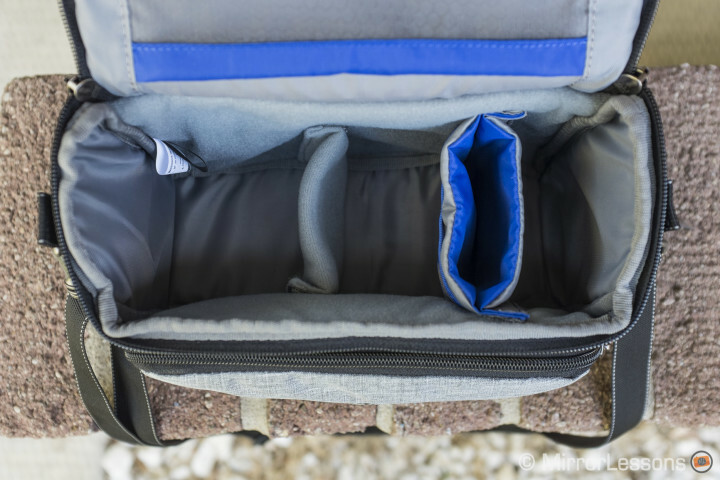 A challenge for camera bag manufacturers is to make bags that not only provide ready access to your gear but also protect it from the elements and prying eyes. 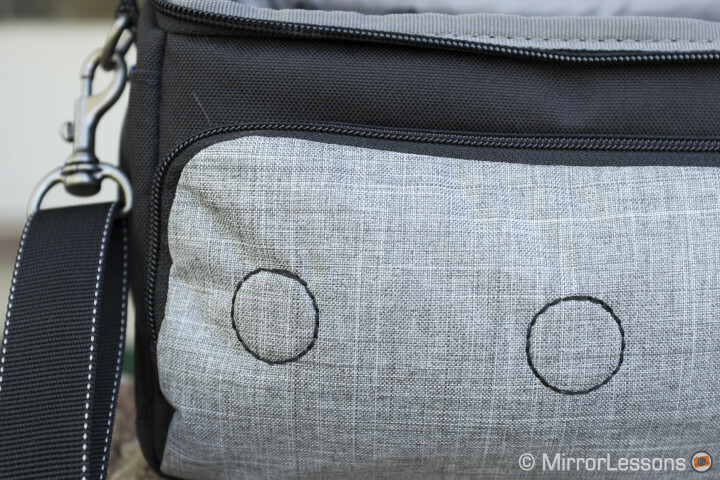 Think Tank has come up with an interesting solution in the form of magnetic closures that keep the lid attached to the body of the bag even when you haven’t zipped it closed. 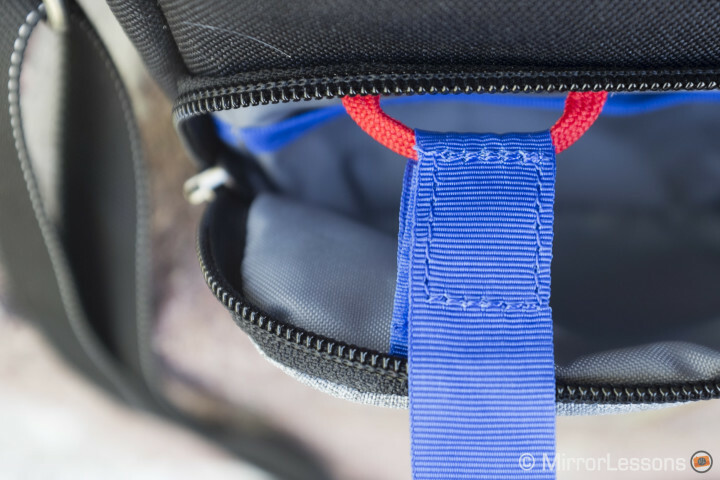 Be aware however that the magnetic closures aren’t a substitute for the zipper, which is why you should never pick up your fully-loaded bag by the handle if the zipper isn’t at least partially closed. If you do, the bag will swing free of the lid and spill all your precious belongings onto the floor. This is one of two bugbears I had with the Mirrorless Mover 20, as it is all too easy to absent-mindedly pick up the bag, thinking that it is closed when it actually isn’t. The other was the detachable shoulder strap. 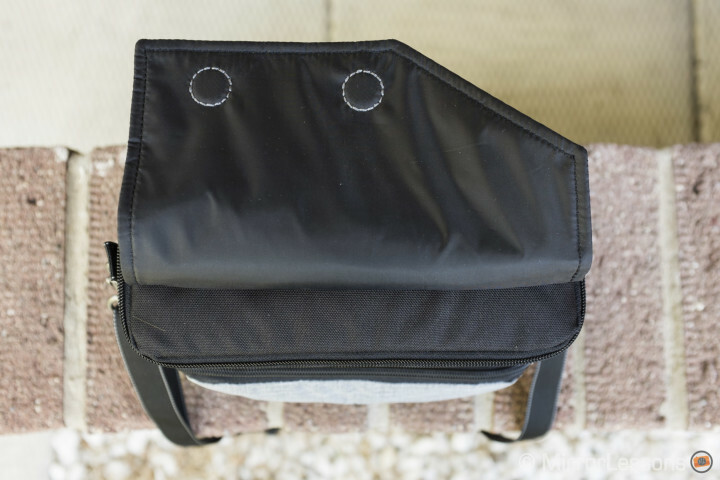 While the rest of the bag is constructed of high-quality fabrics and metal hardware that could stand the test of time, the strap sort of feels like an afterthought. It isn’t padded and twists upon itself, so it is always a battle to get it the right way around before placing it over your head. Thankfully, its detachable nature means you can replace it with another, more comfortable strap if you please. Coming back to protection from the elements, you’ll be glad to know that the Mirrorless Mover 20 is water resistant thanks to its water-repellant (DWR) coating on the outside and polyurethane coating on the inside. And should you get caught in a downpour, you also have the option of a semi-sealed rain cover for extra protection, which you’ll find stored inside the front pocket. I’ve been out in the rain a few times with the bag and I’ve always come home to bone-dry gear. 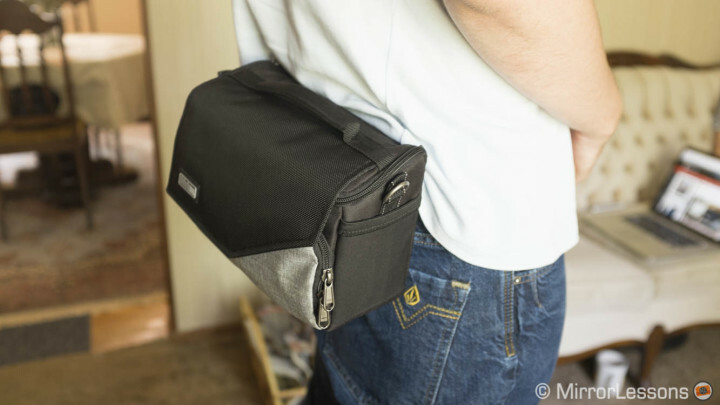 The Mirrorless Mover 20 is available in either black or heathered grey. Though neutral tones render the bag discreet and stylish, I’m sure many, including myself, would like to see it available in a wider range of colours in the future. Should you consider this bag for your mirrorless system? I would say yes if you generally carry around 2-3 small primes, or a medium sized zoom along with a small prime. My impression is that a Micro Four Thirds or Nikon 1 user would find the bag more appropriate than a Fujifilm or Sony user, simply because the lenses are smaller and thus easier to slide into the various compartments. 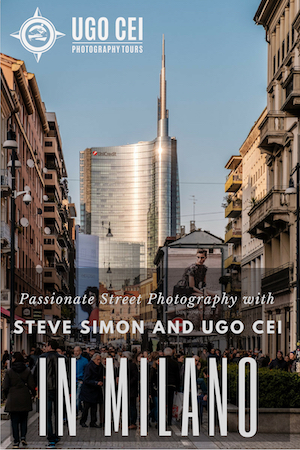 Conversely, a photographer who carries around larger zooms would most likely find this bag too small for his or her needs.